1. What is a XML Vocabulary? 2. What is semantic data interoperability? 3. What is MXV (Model-driven XML Vocabulary)? 4. Why W3C XML Schema & Vocabulary Design? 5. Who can benefit from MXV? A XML Vocabulary is a collection of pre-defined XML tag names and meanings for a distinct business scope or industry. XML is sometimes referred to as one of the most revolutionising standards in the IT industry. However, XML is is only a format, which does not reveal the meaning of its data payload. When two parties exchange information in an XML format, humans or computers can easily 'read' the files. Correctly deducing the true meaning though is not so simple. While humans are able to interpret and enquire, computers are not capable of asking about meaning. Accurate and efficient data interpretation and processing requires an agreed and precise XML vocabulary. Beyond the ability of two or more computer systems to exchange information, semantic interoperability is the ability to automatically interpret the information exchanged meaningfully and accurately in order to produce useful results as defined by the end users of both systems. 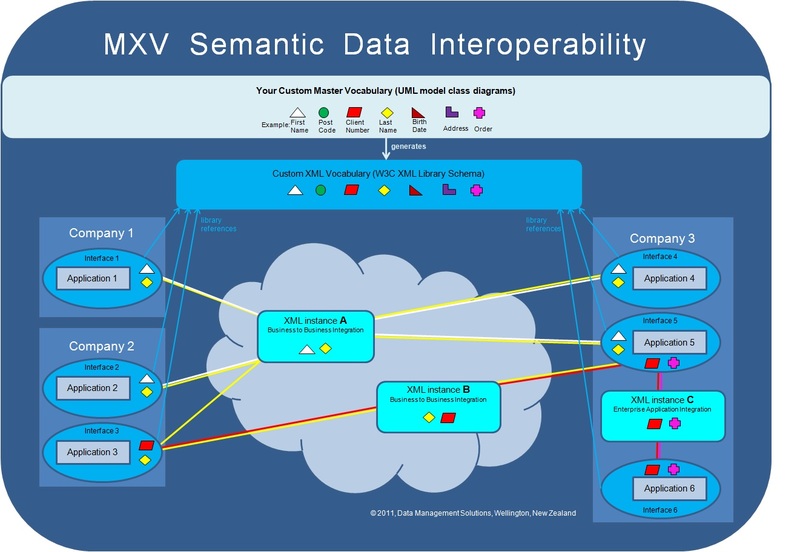 To achieve semantic interoperability, both sides must refer to a common information exchange reference model [such as a XML vocabulary]. The content of the information exchange requests are unambiguously defined: what is sent is the same as what is understood. 3. What is a Model-driven XML Vocabulary (MXV)? Many organisations have long recognised the value of information: Linking distributed information enables organisations to function with a new openness. For example, a government communicating with its citizens, or a business combining information for making well-informed decisions. Sharing data, and thus making systems interoperable, is progressively becoming more important for a wide range of organisations, including governments. But access to distributed systems is often restricted to a select few. As a result, point-to-point data exchanges have become common. Organisations are increasingly struggling to sustain the ever-growing number of such non-standardised data exchanges fraught with misunderstandings, processing errors and data quality issues. Many organisations are acutely aware of the consequences they are suffering from inadequate interoperability and the drawbacks of point-to-point data exchanges. Many XML implementations are plagued by the lack of both a XML vocabulary and an enforced W3C XML design standard. The W3C XML Schema language itself is often unfairly blamed for this situation, when in fact the problem is caused by the inconsistent ways XML is applied across projects and time. But there is a proven solution to this: Using MXV, an enterprise data model can now also be implemented as W3C XML Schema, comparable to implementing a data model as a relational database. The resulting XML vocabulary enables semantic interoperability, where sender and receiver of a message share a common understanding of the meaning of data items. The XML vocabulary itself complies with a number of commonly used open standards, thus further improving interoperability. Read on if this sounds like what your organisation needs. Otherwise, MXV is probably not suited for your organisation. In 2006, the New Zealand Ministry of Education (MoE) adopted MXV. For the real life business background of Student Record Transfer (SRT), one of MoE's MXV based interoperability solutions, see http://vimeo.com/19733408. Data Management Solutions will provide the intial MXV setup and configuration, ongoing ad-hoc support, and also training if desired. With the outsourced MXV option, Data Management Solutions is responsible for all of the above. I do not recommend outsourcing the UML Master Vocabulary though, because it is a business asset too valuable to lose control over. Perhaps it can be safely outsourced if it is small, simple and not business critical. With the 'in between MXV arrangement', your organisation and Data Management Solutions agree on a split of responsibilities. One prudent split could be that your organisation is responsible for maintaining the UML Master Vocabulary as well as specifying data exchange and validation requirements, while Data Management Solutions is responsible for delivering the resulting artefacts. If you wish to discuss any of these MXV deployment options, please contact me. See my résumé for more details, or feel free to contact me.